Excellent flowers for arrangements, fresh or cuts or dried. HEIRLOOM. An attention-getter in the border. Stems are arrayed with spectacular green bell-shaped bracts that are straw- colored when dried. 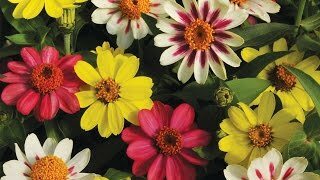 Grows best in full sun to partial shade in well-drained soil. Bells Of Ireland, Moluccella Laevis is rated 2.9 out of 5 by 7. Rated 5 out of 5 by mtgardner from These area a great bushy plant. I direct planted these at the end of May. It's mid August and the plant is about 20" tall and continuing to grow. Rated 1 out of 5 by ehea from very little germination bad seeds from burpee this year, very few seeds actually did anything across the board. Rated 3 out of 5 by Rothe from I have not had luck with this plant. I followed the directions on the seed packet and sprouts grew to about one inch tall then died. Hoping for better luck when the weather cools again. Rated 4 out of 5 by koffeebraker from So lovely! I planted these two years ago and was very, very pleased. They are stunning. I didn't have to do anything special (I watered in the a.m. and misted at late afternoon/early evening); I planted them and they grew. Everyone who saw them commented on them, and a couple of friends have asked what these plants are called and where they can get them. Of course, I made referrals! I've ordered some more this spring and am looking forward to planting. Rated 4 out of 5 by Anonymous from My Personal Favorite I found these to be a beautiful addition to my garden. Very Stunning. Did require some staking. Rated 1 out of 5 by cotton from No luck with these I purchased these seeds and started indoors with my grow lights and heat mats and still had no luck. A few sprang up but were so lanky that they never amounted to anything. I really loved these and was disappointed.